Bamboo Xylophone - ARTE AMAZONIA provides a global voice through art for the indigenous cultures of the Amazon. 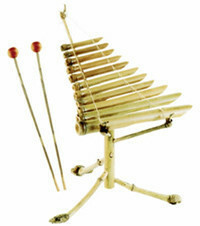 This bamboo xylophone is light weight and easy to assemble! Take it with you where ever you go... to the park or even to school to liven up the class. The video below shows how easy it really is to put together. A clever sustainable design, that makes a great sound too! Details: The vietnamese xylophone, T'rung is one of the popular with the Bahnar, TSedan, Giarai, Ede and other ethnic minority people in the Central Highlands of Vietnam. It is used for all kinds of occasions, especially for spiritual ceremonies. It is made of 12 or more bamboo tubes differing in size, with a notch at one end and a beveled edge at the other. The long big tubes give off low-pitched tones while the short small ones produce high-pitched tones. The tubes are arranged lengthwise horizontally and attached together by two strings.